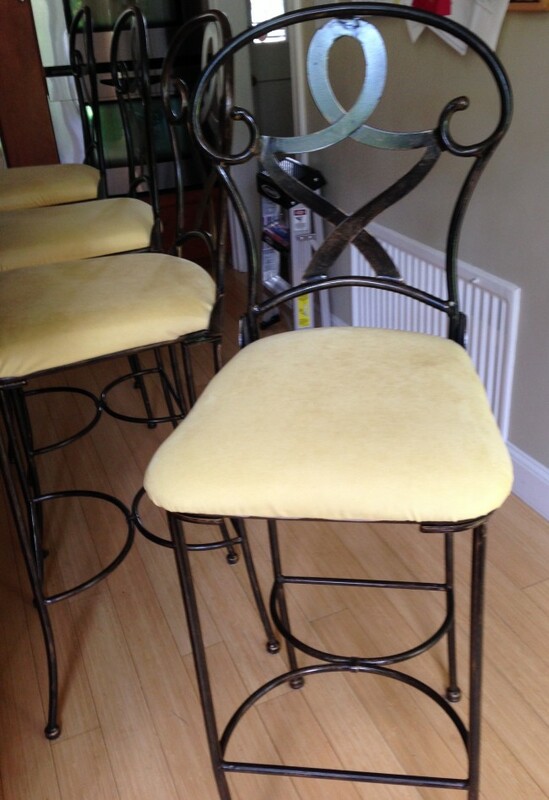 Who knew I could re-cover our bar stools all by myself? Bought the fabric. Unscrewed the seat from the frame. After several bad choices, found the right tools. Painstakingly removed the staples holding the old fabric down. Stretched new fabric over the wood and foam. Staple, staple, staple. Screw, screw, screw, screw. Don’t look too closely or you will see that I am new to this re-covering business. The rest of the family is not convinced that yellow was the best color choice. We’re moving and I should do the exact same thing with my bar stools, except that the difference between us is that I won’t. The color looks really pretty, a soft lemony white. Congrats! It took far longer than I expected, but considering I’ve been thinking about doing it for five or six years, I’m glad I finally took on the project. Good luck with your move! We are in sync…I’m recovering a stool I made from scratch in my elementary school shop period-now an antique-which has had the original green corduroy cover all that time and had only faded. Actually I’ just laying the new and lighter fabric right over it to gain some softness…and freshness. What’s antique is the idea that the school system would let you work with tools in elementary school. These days they wait until high school and you probably have to wear full body armor while you work. 😉 I’d love to see the stool when I’m over next.